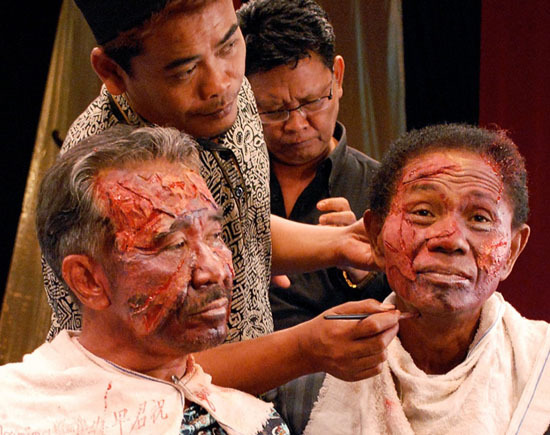 On Monday December 10, 2012, marking Human Rights Day, Joshua Oppenheimer’s documentary The Act of Killing (see reviews here in the WSJ and here in The Guardian) was screened at 40 venues across Indonesia. The free screenings were held discreetly, at the request of the film makers – Oppenheimer is unable to return to Indonesia for security reasons, while one of his co-directors and most of the crew can only be credited as ‘Anonymous’. With these challenges in mind, Oppenheimer and his collaborators want to ensure that as many Indonesians as possible have the opportunity to see the film. Hence these screenings, held from Aceh to Papua, and the promise of support for anyone who wishes to organize future screenings for their own communities. Championed by Werner Herzog and Errol Morris, who are also executive producers, the film looks at the 1965-66 killings of suspected members of the Indonesian Communist Party (PKI), then the second largest Communist party in Asia. The nationwide massacre is a trauma that affected communities across most of the country, but has only recently been explored by the Indonesian media and was not until this year declared a violation of human rights by Komnas HAM (the National Commission on Human Rights). It remains a taboo topic in conversation as well as in film, although there is a sense that this is beginning to change – and this documentary is likely to play a substantial role in that process. 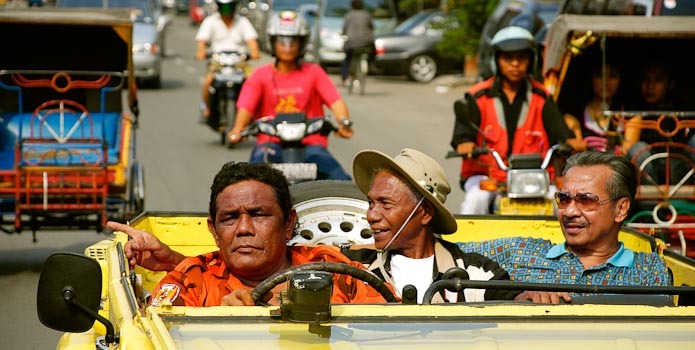 The film focuses in particular on three former death squad members in Medan. In the 1960s, they were the cinema gangsters, or preman (a word which, they repeatedly point out, derives from ‘free man’; “Relax and Rolex” is their declared philosophy). Today, these men are treated as role models rather than criminals. The film’s unique narrative form stems from the discovery that while the families of the victims are still too afraid to speak out, these perpetrators have no such inhibitions – and as film buffs of a sort, are keen to portray their experiences through creating a movie of their own. A man called Anwar Congo is the focal point of the group, still trying to forget his deeds with music, alcohol, and drugs, still haunted by bad dreams. “I’m always gazed at by those eyes I didn’t close,” he says, speaking of one victim who returns to him at night. As Herzog and Morris have been in the past, Oppenheimer is unflinching in revealing the horror of the act without standing in judgment over the perpetrator. His gift is to be accepted as an observer, almost unnoticed – even at a visit to the dentist or during one of the more surprisingly disturbing scenes of the film, Erman brushing his teeth. From moment to moment, the film is surreal, absurd, gut-wrenching and, over the course of 159 minutes, consistently compelling. “Like all great documentary,” says Morris, “The Act of Killing demands another way of looking at reality.” This is achieved through the making of a film within a film, featuring characters whose actions are deeply influenced by film itself – whether anti-Communist propaganda or Hollywood westerns that showed ‘cool ways of killing’. One of their repeated objections to the Communists was their desire to ban American movies from Indonesian cinemas. Discussing the film that they themselves are making, they solemnly acknowledge the need for humour, comic relief from the violence, in order to keep the audience engaged. Characters debate the difference in meaning between ‘cruel’ and ‘sadistic’, comment that “for massacres, pants should be thick”. “Although we’re only cinema thugs, we want to feel like people in the movies,” says one. They find few real-life models for appropriate behaviour – when speaking about parliament, which should be a “noble” place, one character comments that it is instead populated by “robbers with ties”. By revealing this basic truth, he was also “undermining the cartoonish nightmarish vision of other genocides…Hitler too was not a monster…George Bush was a human being”. It’s clear that Oppenheimer cares deeply about some of these characters; appalling as their actions are, he acknowledges how difficult it must be for them to admit to themselves that what they did was wrong, to live with that fact. For more information about the film, visit theactofkilling.com.